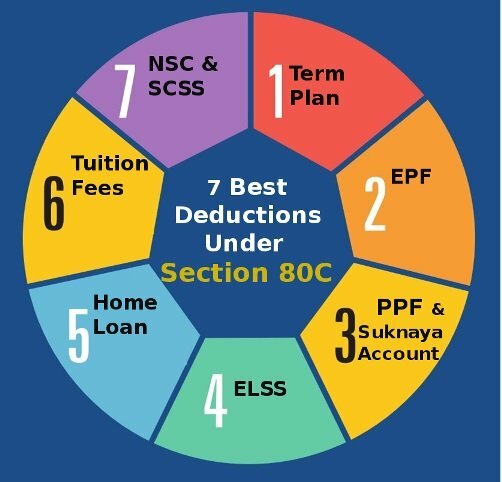 Section “80C” which is the most widely used section of the Income Tax Act and the deductions available, there is various subsection available in this segment. Under this guide, we will understand all about income tax deduction under section 80C, 80CCD, 80CCC & 80CCG. Whether the taxpayer filling there returns in ITR I to V, the deduction under section 80C and their subsections are permitted. What are the deductions available under Sections 80 C? Section 80C consists of several segments permitted for the taxpayer to deduct their said expenditure from their income, which results in tax saving. PPF (Public provident scheme) is the long-term investment segment which was governed by the Government of India, the investor gets a certain rate of interest which is variable. The investor gets the tax exemption up to ₹ 1,50,000 if invested in PPF. These segments consist of tax saving investment in the mutual fund which is exempted up to ₹ 1,50,000, this way people are also encouraged to invest in mutual funds. Tax saving bank FD is just like a normal fixed deposit with any nationalized bank, the only restriction is (5 years lock-in period). If you opt for tax saving FD with the bank you will get the benefit of tax saving up to ₹ 1,50,000 with the restriction that you can not withdraw before 5 years. If you do the amount will be added to your income. Paying you child tuition fee is also exempted u/s 80C by the department of Income-tax if you paid for the school, college or institute situated in India. The tax exemption is only allowed for two children up to ₹ 1,50,000. Having a life insurance policy whether in a form of term plan or some other endorsement plan, secure your family for any unhappening. The Premium paid for yourself, your spouse or your children up to ₹ 1,50,000 is exempted u/s 80C. Premium paid for your parents is not included, you can avail insurance premium payment of more than one. Any insurance company policy is considered, whether it is public or private. Payment of interest amount already exempted u/s 80EE (The maximum limit for claiming deduction under section 80EE is ₹50,000). And, the principal amount repayment is exempted u/s 80C, so if you are having a home loan don’t format to claim repayment of principal amount u/s 80C. Other then principal amount repayment expenses incurred on stamp duty and registration charges for purchase of house property also qualify for tax deduction u/s 80C. This segment is as same as “Tax saving bank FD”. You can go for one year, two years, three years or four years but the investment made for 5 years under the scheme would be considered as exempted u/s 80C. Important Note: Section 80C, 80CCC and 80CCD(1) are permitted in totality of tax exemption upto ₹50,000. Under section 80CCC the taxpayer avail the benefit of tax deduction maximum to ₹ 1,50,000 for certain pension fund. If the amount claimed u/s 80CCC for the pension fund, it should not be claimed in any other section. In other words, this section is the contribution of the employee maximum deduction allowed is 10% of salary or 20% of gross total income if self-employed. This was the new section introduced for an additional deduction of section 80ccd(1) of ₹ 50,000 to pension scheme of central government. The total tax benefits that can be claimed against NPS u/s 80CCD(1) + u/s 80CCD(1B) equals to 2 Lakhs for financial year. This was another addition contribution to pension scheme of central government of India for the taxpayer from employer side up to 10% of the salary of the employee. This section is a very interesting deduction “Investment made under equity saving scheme”. Under this section, if you are a first-time equity investor, this action strengthening the power of investing for the individual. The individual having a valid Demat account indulge with equity market or derivative market avail the scheme with 25 % tax benefit for the maximum investment of ₹ 50,000. If the taxpayer investment of ₹ 50,000, he will get the tax benefit of ₹ 25,000.